A good number of two-year-old races to consider so I will keep this as succinct as I possibly can. 1:50 Nottingham - Looks a competitive race over 6f 15y on good to soft going. Tafaakhor will be a difficult customer to beat and I'm hoping this son of Dark Angel is well backed to put a little meat on the bone for James Fanshawe's Bellevarde, who race is the name of Walter Swinburn's ''better half''. This daughter of Kodiac run well on debut when fancied in the betting. She cost 125,000G at the yearling sales and I expect a big run from this bay filly. Ideally, I would want 4/1 to bet each-way rather than take on Hannon's charge in a fight to the death (so to speak). Interesting. 2:00 Newbury - A Plus 10 maiden over 7f on good to firm going. A sizable field to add to the competition. Thaaqib is worth noting in the betting. Charlie Hills two-year-old was fancied to go well on debut at Newmarket and far from disgraced in fifth, This grey son of Invincible Spirit cost 450,000G at the yearling sales and better will be seen of this progressive horse. If priced 13/2 & less SP I would be very surprised if this horse isn't placed at least. Worth an each-way bet if in that best guide. Asaas is also worthy of your time. Roger Varian holds this son of Distorted Humor in some regard and looks a live chance. 2:30 Newbury - Something of a hit and hope here but if you like a speculative bet then we have a debutante priced 66/1 which may have a glimmer of hope. Joyful Dream is trained by Stan Moore and bought in by the vendor for just 9,000E at the breeze-up sales. Although a tall order, Moore holds this chestnut filly, a daughter of Dream Ahead, in some regard. May be worth a bet and hope she's backed or cross your fingers and consider this juvenile may show some ability. 6:30 Pontefract - A decent race for a maiden auction stakes. A large field of sixteen two-year-olds over 6f and a couple of debutantes which I imagine connections will fancy are going close to winning. Karl Burke can win with his juveniles on their racecourse bow and Faulkwood is high up in the pecking order for Spigot Lodge. This grey son of Hellvelyn cost £23,000 at the breeze-up sales and may turn out to be a wise purchase. This Plus 10 race has fair price money to make a pretty good payday for the winner and I imagine it has tempted a few smart juveniles for this grade. Debutantes can be tricky horses to bet but if priced 10/1 & less SP have respectable each-way claims. Canford Bay is held in some regard by Michael Dods although a wide draw isn't ideal. Ritchie Fiddes [owner]does well with this stable and they can go well on debut although I often find unless favourite they go better at bigger than shorter odds. Have respectable place claims. 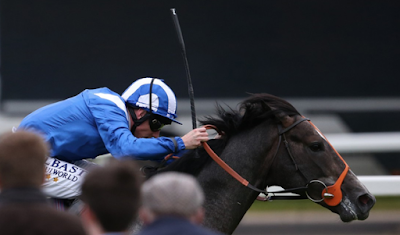 An outsider who may be worth a small each-way is Richard Whitaker's Silk Mill Blue. This bay gelding is bred to be speedy out of Piccolo and a sprinting mare. He was terrible slow away at Carlisle when a 66/1 shot but battle on well and in all fairness made up a huge amount of ground without ever reaching the leaders. He's priced 50/1 but could well prove those odds wrong. Not without a hope if starting on terms and will appreciate this extra furlong. 6:40 Hamilton - Getting to the end of my tether with Andrew Balding's Leontes. This chestnut son of Paco Boy has not had much luck in the sense he keeps finding difficult races. This looks about as good chance as he will get although he doesn't seem the most enthusiastic of souls in ways and a bit awkward when battling to the line. I wouldn't bet on him unless an each-way price [unlikely] and more the type to stick in an each-way double, treble or multi bet. Should hot the frame.